Tondo, referred to also as ‘Tundo’, ‘Tundun’ and ‘Tundok’, was a fortified Philippine kingdom whose capital was located north of the Pasig river which flows into the Manila Bay on the archi-pelago’s largest island of Luzon. It is one of the older settlements mentioned in the Laguna Copperplate Inscription which dates back to 900 AD. Tondo was an ‘Indianized’ kingdom in the 10th century. It was based essentially on Hindu and Buddhist cultural and economic influences that permeated most of Southeast Asia at the time. Despite being culturally akin to Hindu cultures, kingdoms like Tondo were truly indigenous and independent of India but they nevertheless enthusiastically adopted elements of ‘raja-dharma’ (Hindu and Bud-dhist beliefs, codes and court practices) to legitimate their own rule and constructed cities. Indianized kingdoms in Southeast Asia developed a close affinity with India by internal-izing Indian religious, cultural and economic practices without significant direct input from Indian rulers of the sub-continent themselves. A present-day example of an Indianized culture that has survived is that now found on the island of Bali in Indonesia. Balinese are people of Malay stock whose majority practice the Hindu religion in a somewhat familiar but localised form – one amidst a modern nation which is otherwise dominated by Islamic religious beliefs. An obvious attribute of the cultural links between Southeast Asia and the Indian subcon-tinent is the spread and absorption of ancient Indian Vedic/Hindu and Buddhist philoso-phies and culture into present-day nation states such as Myanmar, Thailand, Malaysia, Laos and Cambodia. Indian scripts are also found in Southeast Asian islands ranging from Sumatra, Java, Bali, south Sulawesi and most of the Philippine Archipelago. What is now known about the Kingdom of Tondo is that it initia-ted diplomatic ties with China during the Ming Dynasty which ruled China from 1368 to 1644 AD, following the collapse of the Mongol-led Yuan Dynasty. The Ming Annals record the arrival of an envoy from Luzon in 1373 AD. From these records, it is ap-parent that the rulers of Tondo were acknowledged not as mere chieftains, but as kings. This reference places Tondo into the larger context of Chinese trade with the peoples of the Philippine archipelago and explains why it also became a do-minant force in regional trade. From that view-point, Luzon and Tondo thus became a centre from which Chinese goods were traded all across Southeast Asia. Chinese trade was so strict that Luzon traders car-rying these goods were considered “Chinese” by the people they encountered. Cultural links between what are now China and the Philippines date back to the peopling of these lands. But the earliest archeological evidence of trade between the Philippines and China takes the form of pottery and porcelain pieces dated to the Tang (618-907 AD) and Song (960-1279 AD) Dynasties. Tondo’s existence has already been established and the archeological evidence indicates that both it and the older Namayan Kingdom in Luzon were part of this trade. The rise of the Ming dynasty also witnessed the arrival of the first Chinese settlers in the Philippines. They were well received and lived together in harmony with the existing local population eventually intermarrying with them such that today, numerous Philippine people have Chinese blood running in their veins. Tondo’s regional prominence in trade and alliance with Brunei Darussalam’s Sultan Bolkiah (1485 AD-1524 AD), however, led to its peak age as a maritime trading force even as relations bet-ween them date farther back in history. The political, economic, religious as well as socio-cultural relations between these two countries have existed for more than five centuries and height-ened even more during the period when the Spanish, the Portuguese and the Dutch were contesting supremacy over territories comprising the Malay Peninsula and large swaths of Southeast Asia. In that aspect, a more important relationship had been cemented through a stronger bond of blood-based affinities between the Bruneian royal families with mem-bers of the Filipino nobility of the 15th century. The Kingdom of Tondo became so prosperous that around the year 1500 AD, Sultan Bol-kiah (an ancestor of the present ruling Sultan Bolkiah Hassanal) ‘merged’ with it by a royal marriage of Gat Lontok, who later became Rajah (Lord) of Namayan, and Dayang Kay-langitan (or ‘Princess of the Heavens’) to establish a city with the Malay name of Seludong (later on to become the city of Maynila) situated on the opposite bank of the Pasig River. The traditional rulers of Tondo – the Lakandula (literally, the “Lords of the Palace’), re-tained their titles and property but the real political power now resided in the House of So-liman, the Rajahs of Maynila whose line eventually formed the Tagalog ‘Maginoo’ ruling caste of Tondo. Years after Magellan’s death in 1521 at the hand of a tribal chieftain named Lapu-lapu, the Spanish belatedly returned in force 50-years later and defeated the local rulers whose domin-ions surrounded the Manila Bay by 1591. Spanish records men-tion three rulers who played significant roles after the arrival of Miguel Lopez de Legaspi y Gurruchátegui (1502-1572 AD) on the island of Cebu in the Visayas region of the Philippines to-wards the latter part of 1570 but more particularly related to his two much younger Lieutenant-commanders – Martín de Goiti and Juan de Salcedo both who, pursuant to the orders of King Philip of Spain to colonize the Philippines, ex-plored the northern region of Luzon (see map) where the Kingdoms of Tondo, Namayan and Maynila were all situated. The Filipino rulers at that time were Rajah Matanda – referred to as El Viego (the ‘Old Man’), and also known as Ache; Rajah Lakan Dula; and, their nephew Rajah Sulayman III – referred to as Rajah Mura or the ‘Young Rajah’. Rajah Matanda and Rajah Sulayman III were joint-rulers of the Malay-speaking Moslem Kingdom of Maynila, while Rajah Lakan Dula ruled over the Hindu-Buddhist Kingdom of Tondo. The Spanish conquest of Luzon culminated in the Battle of Bankusay which occurred on 03 June 1571. After that episode, the area comprising the Kingdoms of Tondo and Namayan also came under the administration of Spanish Manila ending their existence as indepen-dent states. Under Spain, the City of Manila became the colonial entrepôt in the Far East. Tondo as a place today continues to exist as a district of the city of Manila, which is part of the larger Metro Manila. This entry was posted in Bulwagan Foundation Trust, Philippine History and tagged Bulwagan Foundation Trust, Karl Quirino, Kingdom of Tondo, Philippine History, The Community WellNZ Project. Bookmark the permalink. Just enter your email address to follow this blog and receive notifi cations of new posts by email from us right at your doorstep! This site is a member of the Filipi nos in New Zealand network of websites which can be accessed through its Community Page on Facebook. 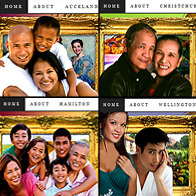 The community devel opment model which the Bulwa gan Foundation Trust espouses de pends on closer cooperation and collaboration among individuals and organisations both within and outside of the immediate Filipino-Kiwi community. By fostering clo ser ties, the model can build aware ness, cooperation, ownership, and strengths that can be applied to a variety of community issues, prob lems, challenges and even joint projects. More importantly, it can foster self-reliance and communi ty action targeted towards com mon goals and mutual outcomes. In Wellington, Filipino-Kiwis repre sent the largest component of resi dent communities from 9 other Southeast Asian countries which together form the ASEAN group. Here, you can visit their Facebook community pages by simply click ing on their individual image panels below. Welcome To Our Community Site! Including all content. All Rights Reserved.